I was speaking yesterday at the launch of Business in the Community's Corporate Responsibility Week. One of the issues that came up a lot during and after the session was the issue of trust. I think it is becoming increasingly clear that the essence of the present financial crisis is a collapse in trust: including trust between banks and other banks; between banks and their customers; and indeed between banks and governments. The Street has suffered a serious decline in trust. Yet trust is its most important asset. Financial markets trade in promises -- that assets have a certain value, that numbers on a balance sheet are accurate, that a loan carries a limited risk. If investors stop trusting those promises, Wall Street can't function. But in the last few years, many Wall Street promises have not been worth the paper they're written on. That's because, when the securities market was roaring, many financial players had no idea what they were buying or selling, and worse, they didn't care. Derivatives on derivatives; so-called special investment vehicles to move assets off balance sheets; credit default swaps; and of course securities backed by risky home loans. There seemed no limit to the financial smoke and mirrors. That meant almost no limit to what was promised. And regulators looked the other way. It worked great as long as everyone kept trusting and the market kept roaring. But all it took was a few broken promises for the whole system to break down. What to do? Not to socialize capitalism, as is now being done. What's lacking isn't capital, it's trust. And the only way to rebuild trust is through regulations that require financial players to stand behind their promises and tell the truth, along with strict oversight to make sure they do. Irish bankers have presided over the loss of approximately 80% of the value of financial stocks since their peak on 21st February 2007. That's a lot of ground to make up before we're even back to square one. No wonder the Irish Association of Pension Funds is warning about a possible collapse in some defined benefit pension funds. I can't see us getting back to the peak for a decade or more (in real terms: runaway inflation might get us there sooner in nominal terms). In my more pessimistic moments I think it might take a generation. Recovery requires (re)building trust. But that is far more difficult when trust has been lost than when it wasn't there in the first place. There's an interesting debate about trust in society on the usually fascinating Thinking Allowed series on BBC Radio 4. Onora O'Neill (no relation!) and Mark Kohn discuss the lack of trust in various public representatives, including politicians and bankers. The interview took place in July, I'm guessing bankers might come off even worse in light of recent events. Kohn makes the point that game simulations of trust show that the best strategy is, in the first instance, to assume that the other party to an interaction is trustworthy and will reciprocate any positive gesture. But if the other party fails to reciprocate then there is no trust and the outcome is much worse (and harder to reverse) than if trust had been built at the start. cits due to a higher level of information attained by individuals in high-trust societies, the moderation of conflicts regarding the wealth distribution in environments of high trust, and the possibility to make credible promises for compensation of reform losers. 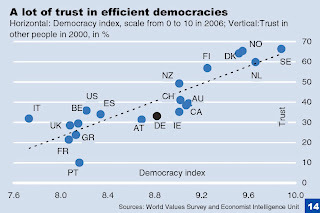 And as a recent DB Research report (from which the chart above) shows, there is a strong correlation between levels of trust in society and numerous other indices, including freedom, the health of democractic institutions, economic growth and innovation levels. Great article, It would be interesting to consider what reforms Ireland can implement to best restore trust. Tackling public and private sector excesses strikes me as a good place to start. I find thinking of the financial mess we are as a result of a decline in trust provides clarity to the whole issue. Thanks. Great article, many thanks. Reich also made his point pointedly on a recent Sunday-morning TV talk show in the States; in response to a statement that the crisis is one of both liquidity and solvency, he suggested the transcendent issue is one of trust. As someone who lectures and consults on trust for a living (generally at a more micro-level), I'm delighted to see you bring together such a range of points on the subject. I'll emphasize just two. One is the value of transparency, whether in interpersonal dealings or accounting data. Transparency is the best tonic for suspicion. The other is the presence of both systemic and time-based relationships. If a system is composed of fragmented parts relying solely on market interactions, with no one having ownership of the whole and no holistic regulation, the odds of a trust violation are high. Ditto for a system in which each interaction is a one-off, with no ongoing relation (this is akin to your point about successful game-playing strategies). Put more simply, if the world is made up solely of one-night stands between strangers, watch out. The trick is to put transactions into a series of relationships between individuals that endure over time.